Habitat: Desert. 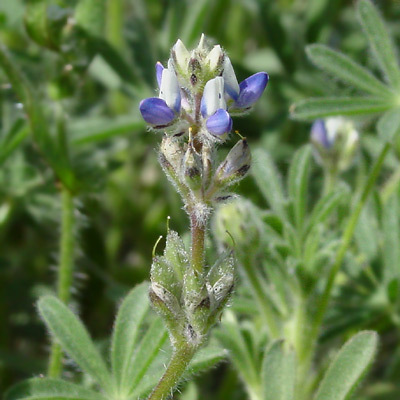 This little wildflower grows in open, sandy, disturbed areas. Description: The small flowers are in several whorls of usually 5 flowers along the short, hairy flower stalks. The individual flowers are pea-shaped and 1/4 inch (6 mm) long. The top banner petal has a squared off top edge and a large, white patch with dark blue dots. The white patch on the banner petal turns magenta with age. The leaves are palmately compound with 5 to 7 green leaflets. 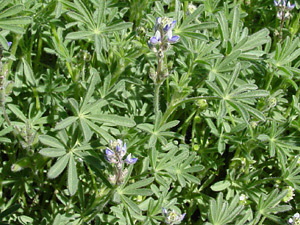 The similar Shortstem Lupine (Lupinus brevicaulis) has flowers that are spiraled, not whorled around the flower stalks.